All of my one-of-a-kind totes, crossbody bags, messenger bags & accessories are made from NEW vinyls, leathers and fabrics rescued from the furniture mfg. industry. It's always fun to make something beautiful & useful from scraps, bolt ends and mfg. rejects. I have always been a textile junkie and can't bare to see them go to waste. My scraps are then passed on to other artists, who make beautiful items too. If you see something you like but need a different size, feel free to contact me. If I have more of the fabric I will be happy to make one to your needs. 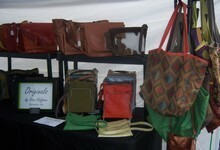 Check out my etsy store or my new webpage www.kinahoffman.com for available bags & accessories. I will gladly combine sales from my etsy store and webpage to save on shipping. You can call me at 419-343-2667 or email me at info@recycledoriginals.com for estimate on shipping.